In California, you can get a “Save the Whales” custom license plate. Meanwhile in the great state of Pennsylvania, you can now get a handsome, custom plate that helps raise money for the shooting sports. Thanks to Friends of NRA committees throughout Pennsylvania, PennDOT now offers NRA-specialized license plates. The Keystone State joins a growing list of states with NRA-themed plates. Revenues from the plates (after PennDOT takes its share) will help fund NRA Foundation programs. Proceeds go to the NRA Foundation, the country’s leading charitable organization in support of the shooting sports. Since its inception in 1990, the NRA Foundation has awarded more than $140 million in grants. Grants awarded by the foundation provide essential program funding for youth education, law enforcement training, hunter education, conservation, firearms and marksmanship training and safety, and much more. Share the post "PennDOT Now Offers Customized NRA-Themed License Plates"
This past weekend, top pistol shooters from 28 states, one U.S. territory and three foreign nations competed at the 2013 Smith & Wesson IDPA Indoor National Championships in Springfield, Massachusetts. Robert Vogel successfully defended his Stock Service Pistol division title for the sixth straight year. Second place in the SSP division went to Rob Tate who claimed first Master and the High Military Veteran title. In another impressive performance, our friend Randi Rogers won the High Lady title for the fifth year in a row. You go girl! Randi Rogers also claimed second Master. High International title went to Luis Ricardo Zanotti of Venezuela. Vogel, the first IDPA shooter to claim the sport’s Distinguished Master classification in all three pistol divisions, won all but two stages in the championship to outpace his nearest competitor by nearly 30 seconds and finish with a final time of 154.37. That’s dominance. In addition to winning the SSP title, Vogel earned High Law Enforcement and High Industry honors. “Bob Vogel is riding an incredible win streak in IDPA that extends back to the 2007 IDPA Nationals.” said Joyce Wilson, executive director of IDPA. To learn more about the IDPA or to find a club near you, visit IDPA.com. You can also visit the IDPA Facebook Page, watch IDPA TV, and read the DOWN ZERO Blog. Share the post "Bob Vogel Wins Sixth Straight IDPA Title at Indoor Championships"
The National Shooting Sports Foundation (NSSF) has produced a video in which management and employees of three Connecticut-based companies, O.F. Mossberg & Sons, Stag Arms, and Ammunition Storage Components, talk about the importance of their jobs and how their companies contribute to the Constitution State’s economy. NSSF and member companies based in Connecticut and western Massachusetts have been working for several weeks to help educate legislators, the media and the public not only about the economic impact of the firearms industry in the Constitution State, but also what measures are most effective at keeping firearms out of the hands of criminals and unauthorized individuals. To that end, NSSF President Steve Sanetti authored an op-ed in The Hartford Courant, entitled “Focus on Gun Access, Not Gun Ban”. Connecticut has a long tradition of arms-making. In 1848, on a site overlooking the Connecticut River in Hartford, Samuel Colt built the Colt’s Patent Firearms Manufacturing Company factory. A larger factory, called the Colt Armory, was added in 1855. The 1850s were a decade of phenomenal success for Colt’s Connecticut-based enterprise. Colt’s Mfg. was the first to widely commercialize the total use of interchangeable parts throughout a product. A leader in assembly line practice, the company was a major innovator and training ground in manufacturing technology. Colt’s armories in Hartford trained several generations of toolmakers and machinists, who had great influence in American manufacturing. Prominent examples included F. Pratt and A. Whitney, and Henry Leland (who would end up at Cadillac and Lincoln). Share the post "Connecticut Firearms Manufacturers and Employees Speak Up"
Many of our readers want a custom rifle that looks as good as it shoots. When it comes to wood stocks, one of the most prized materials is fine Turkish Walnut. You’ll find a wide selection of Turkish Walnut blanks at the HunterBid.com website. Hundreds of selections are available at auction. Prices start as low as $150.00. The finest blanks sell for $1,000 or more. You’ll find both one-piece blanks (for rifles) and two-piece blanks (for shotguns). Most blanks are 36″ or shorter, but some longer Mannlicher blanks are available. Here are two examples from past auctions. The first is an exhibition-grade blank, the second a low-priced blank that still exhibits excellent figure. New blank selections are added to the website every other day. The operators of HunterBid report: “If you are interested in any of our blanks in Hunterbid auctions, but you do not like the bidding process, please give us a call (603) 433-8908 or send us an e-mail. We will help you choose a blank that suits you, and even close the auction for you and ship your purchase the same day.” HunterBid.com is run by Chiron Inc., which is 100% owned by the Ergin family who are of Turkish origin. Chiron maintains warehouses in Dover, NH and Istanbul, Turkey. Share the post "Need Wood? Try HunterBid.com for Turkish Walnut"
The days of the “ORM-D: Small Arms Cartridges” labels for ammo shipments are numbered. The Dept. of Transportation (DOT) is phasing out the current ORM-D ammo labels, replacing them with a larger striped diamond label that does not mention “Small Arms Cartridges”. This change is designed to harmonize U.S. shipping rules with United Nations standards. You can start using the new “Limited Quantity” diamond labels for ammo shipments right now, but the new labels are not yet mandatory. You can continue to use the old ORM-D “Cartridges, Small Arms” labels until December 31, 2013. As of January 1, 2014 you MUST use the Striped Diamonds. In an attempt to harmonize and align with international standards, the DOT has amended the 49CFR regulations regarding the ORM-D classification. Effective January 19, 2011, with the publication of the HM-215K final rule, the hazard class of ORM-D is being eliminated. Those materials may still be shipped classified as a limited quantity (“Ltd Qty”). In conjunction with ORM-D hazard class elimination in HM-215K, limited quantity ground shipments will no longer require shipping papers when prepared under the new rule. This includes those materials previously classed as Ltd Qty that required shipping papers via ground transport. There is a transition period for shippers to comply with the new classification, marking and labeling requirements. Until December 31, 2013 a limited quantity package containing a consumer commodity as defined in 171.8 may be reclassed as ORM-D, or until December 31, 2012 for ORM-D-Air material. UPS began accepting materials with the new markings effective April 1, 2011. Note: To be in compliance with TDG, Standard (ground) Ltd Qty shipments to Canada prepared under HM-215K require the verbiage ‘Limited quantity’ or ‘Ltd qty’ to also be marked on the carton. If you want to still use the ORM-D Small Arm Cartridges Labels until the new Diamond Labels are mandatory, here are links to PDF sheets of ORM-D labels. These PDFs have many rows of labels per page so you can save printer paper. The black version and blue version will use up more printer ink, so you might want to use the white version to be more economical. Share the post "New Diamond-Shaped Ammo Shipping Labels Replace “ORM-D”"
The Nightforce NP-2DD (Double Dot) reticle is popular with both match shooters and long-range varminters. The uncluttered reticle gives you an unobstructed view of the target — and that’s especially important for 1000-yard shooting. You can also use the “gap” between center dot and horizontal lines to judge wind hold-off (this “gap” is 1.1 MOA at 42X and 2.0 MOA at 22X). Some guys use the lower dot for hold-overs when shooting at different distances. At 22X the second dot is 8 MOA lower than the top dot. At full 42X power, the lower dot is 4.3 MOA lower than the top dot. If you have a Nightforce scope with NP-2DD reticle should you click for elevation changes, or hold-over using the second dot? The answer is: “It depends”. Danny Biggs, multi-time U.S. F-Class F-TR National Champion, offered this advice is our Shooters’ Forum: “There is nothing wrong with [using] the NP-2DD ‘over and under’ dots. Try it, and if it works for you, fine. However [in most situations] I would not bother to use it. Rather, I just click up/down the elevation going from 600 to 1,000 yards. There is one exception though where I regularly use the lower dot! That is for 1,200-yard shooting — a fad at the Midwest Palma Championships held annually up at Lodi, WI. Here I fully employ [the hold-over method]. Share the post "Using the NP-2DD Reticle — F-TR Champ Danny Biggs Explains"
To kick off a new week, we are featuring a splash of color — the beautiful blue 7mm-270 WSM of Forum member Ian B. (aka “Elwood”) from Great Britain. A very knowledgeable guy, Ian is one of the UK’s top F-Class shooters. And he’s the proud owner of a very “Flash” F-Class rig. Having spent my first year competing with a magazine-fed 7mm WSM tactical/sporting rifle (Surgeon action and AICS mag) and doing reasonably well with it, I then moved on to a .284 Shehane (.284 Winchester Improved). I love the Shehane and still use it but this year I wanted something for those windy long-range days and so there was only one logical choice, the 7 WSM. This time I chose a 7mm-270 WSM as I quite enjoy case prep (just kidding). Actually, there’s not much to do really. The quality of Norma brass is well known and the Norma 270 WSM brass is quite easy to obtain in the UK. The action is a Right Bolt, Left Port (RBLP) Stolle Panda F-Class action, with Jewell trigger. There wasn’t any particular reason behind the RBLP configuration — it was more of a case of that’s what I could get at the time. I had a 1.250″-diameter, straight-profile Bartlein barrel finished at 32 inches and chambered for the Berger 180gr VLD with a .313″ neck diameter. All my metal work and quite a bit of the wood work is done by the excellent Neil McKillop of McKillop Engineering. As with all top gunsmiths, Neil is meticulous to a point of obsessiveness and he’s the name behind quite a few winning rifles including several used by the GB Open and F-TR teams. Neil also inletted the stock from a blank and did the bedding for the action and the front bag runners. I have one “tried and tested” load: 7mm Berger 180gr VLDs, seated .020″ into the lands, Vihtavuori N165 powder and CCI BR2 primers. This load is supremely accurate, but at 2990 FPS it’s a bit slow. To get more speed, I’m currently testing H1000 with good results, but it looks like I may have a slow barrel. I have another Bartlein barrel chambered and ready to screw on when the weather gets warmer. If that new barrel shoots well, the current barrel will probably be used as a practice barrel. I do full case prep, neck-turning, uniforming primer pockets after the first firing, chamfering necks inside and out, and removing burrs around flash holes. Even the best brass sometimes suffers from imperfect quality control. I try to use Redding dies if possible, and will use bump dies, neck bushing dies, and competition seating dies. I use a RCBS ChargeMaster 1500 to throw a charge just slightly under my desired weight and then trickle-up to final weight using the superb Dandy trickler and a Gem Pro 250 scale. I anneal every other firing using a Bench-Source machine. Before this I used a Ken Light and also did them by spinning them in a drill. Never again will I do that after using the Bench-Source. After I have annealed, I always run a nylon brush wrapped in 0000 wire wool into the neck to remove any debris. I keep to the same lot numbers of primers, powders, and bullets. Even the Bergers can vary from lot to lot — I have two different lots of 7mm 180gr VLDs that vary .020″ from bullet base to the ogive. I trim and point my bullets. Pointing may be a mental thing — I had a fantastic shoot while using trimmed and pointed bullets so I do it all the time now. ( A fellow GB team shot refers to them as “Pointless Dies” — I have witnessed him shoot a 99-14V at 1000 yards with bullets that weren’t trimmed or pointed). My next move will be to start measuring bearing surface…where does it all end? The stock is a custom-made design crafted by Joe and Simon West of Joe West Rifle Stocks. I had several modifications done to one of their existing stock designs. Having done a lot of my shooting with the AICS, I was quite used to a thumbhole stock, so thought I would try one in F-Class. I told Simon what I wanted and he sent me down a prototype made from very inexpensive Tulip wood. We had a few discussions and then made some more mods.. I made two main changes to the stock. First, I removed the lip at the bottom of the pistol grip because I felt I might rest my hand on this and possibly disturb the rifle. Second, I had the protruding pistol grip base removed so that the bottom of the stock was completely flat like the Precision Rifle & Tool F-Class stock. Simon also made the finger grips to fit my hand and flattened them off to allow for a bit more movement. The stock was then sent to Hydro Graphics in the UK to have a custom exterior finish. The paint color is a Marbleized Candy Oriental Blue. As always, Hydro Graphics did a great job. The scope is the excellent 5-50x56mm March with the MTR-2 reticle — far and away the best reticle I have used for F-Class. March makes great optics. During the 2012 European individual F-Class event, using another March (my 8-80x56mm), I could see my shooting partner’s impacts in the white V-Bull at 800 yards! And just recently at a club match I called two V-Bulls at 900 yards using the 8-80X (not at full power). Granted the light has to be perfect to be able to do this, but my highest praise for the Deon Optics glass is that it rivals that of Schmidt & Bender. Having owned both March and S&B scopes and compared them side-by-side, I feel that I can make this statement fairly. UK-based Third Eye Tactical made the nice, 34mm rings. The UK is now producing some excellent products. We now have UK-made custom actions, rings, rails, stocks and more. It would be nice to think we could have a 100% British-made rifle, and not rely completely on USA-made products. I think all we need is the trigger? But I can’t see there ever being a UK-made scope! Share the post "Flash F-Class Rig from the UK — Ian’s Blue Beauty"
Coonan Inc. offers an interesting new handgun, a single-stack semi-auto that fires the .357 Magnum rimmed cartridge. Though the Coonan pistol is similar in appearance to a m1911, it has a linkless barrel, and a pivoting trigger. To feed the rimmed cartridges smoothly, Coonin employs a proprietary magazine with an “articulated follower”. This gun is available in both standard and compensated versions. With these Coonan pistols you can shoot a very powerful defensive round that has a much higher velocity and up to 80% more energy than a .45 ACP. You can also shoot .38 Specials (with a different spring). The .357 Magnum is a very effective self-defense round, offering much higher velocity and energy than the .45 ACP. Consider this, the Coonan can launch 180gr Corbon .357 Mag ammo at 1288 FPS. At that MV, the 180gr bullet delivers 663 ft-lbs of energy. By comparison, a .45 ACP round with a 230gr FMJ running 850 FPS delivers just 359 ft-lbs of energy (at the muzzle). That’s a huge difference — the .357 Magnum delivers nearly 80% more energy (calculated at the muzzle). The “Coonan Classic” .357 Magnum with 5″ uncompensated barrel starts at $1375.00. For $99.99 more you can get a 5.7″ threaded barrel. For $249.99 more you can get the compensated version. Many other options are offered, such as Black Duracote finish with laser-etched black aluminum grips ($299.99 extra). The gun in the video below features the Digital Camo Duracoat package with milled black aluminum grips ($549.99 extra). Share the post "Coonan Semi-Auto Pistol Shoots .357 Magnum Cartridge"
Ph.D Engineer Boris Teper has invented a remarkably compact yet effective torque-setting tool that is ideal for tensioning scope ring fasteners and action screws on rifles. The Torque Settings Driver from Borka Tools is brilliant in its simplicity. The lightweight tool is basically a lever, with a series of hex slots through which a spindle is fitted. The slot position sets the effective lever arm length. How does the tool prevent over-torquing? That’s the magic of Teper’s invention. On one end of the tool is a handle with a spring-loaded ball detent. Once desired torque is reached, the handle overrides the detent, snapping forward so you can’t crank too hard (figure 2 below). The Borka Driver is very easy to use, and despite its simplicity, it is very precise. Lab testing of the Borka driver show that the tool yields the correct torque setting within 4-6% of the true nominal torque measured with a calibration device. That means, for example, if you set the driver for 40 inch-lbs. it will torque the fastener within ± 2.5 lbs of your target setting. That’s as good as some full-size torque wrenches — pretty impressive for a tool that weighs only 4 ounces complete with spindle. And every Borka driver is calibrated to ensure accuracy before it ships. Borka offers many versions of its tool, with torque ranges from 10 inch-lbs. up to 72 inch-pounds. The basic Borka driver, priced at $55.00, offers six (6) preset torque values. For $15.00 more Borka sells a driver that offers twelve (12) preset torque values. This 12-setting tool, which is not any bigger or heavier than the 6-setting model, is cleverly designed — you simply flip it over to switch from the first six torque settings to the second six. This works because the handle has variable “break” resistance depending on direction of travel. Smart. Borka’s most popular torque tool is the 12-setting $75.00 “Military Grade” MG driver, model ATD-15×72-12FS-MG. This offers a dozen torque settings from 15- to 72-inch-pounds. We recommend the “Military Grade” model because it has torque settings laser-etched on the surface of the driver arm (see video). That way you’ll always know your torque values. The “Military Grade” model also comes with 1/4″ hex to 1/4″ square (M) and 1/4″ square (F) to 3/8″ square (M) adapters. The Military Grade Model, intended for use in the field by both DOD and LE personel, has already proved popular with “civilian” tactical shooters. You can store the tool in the supplied fabric carry pouch, or stash it (with needed bits) in your range kit. Where can you get a Borka torque setting driver? All models can be purchased directly from Borka Enterprises by emailing info@borkatools.com. You can also purchase through Manson Precision Reamers, (810) 953-0732. (Dave Manson worked with Boris Teper to get this product to market.) In addition, four models are available from Brownells: ATD-20X4006FS (Brownells item #080-000-734), ATD25X5006FS (Brownells item #080-000-735), ATD-36X7206FS (Brownells item #080-000-736), and ATD-15X7212FS (Brownells item #080-000-737). 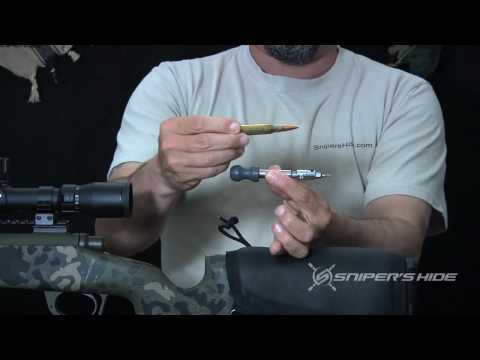 Share the post "Innovative Borka Torque Setting Driver Belongs in Your Toolkit"
Mossberg has added a new Thunder Ranch Special Edition to the MVP (Mossberg Varmint Predator) line of AR-mag-fed bolt-action rifles. The Thunder Ranch MVP features an 18.5″ fluted barrel, and Picatinny scope rail. The stock is finished in Olive Drab (OD) with the Thunder Ranch logo. The rifle is chambered in 5.56×45 NATO (.223 Rem) and the barrel twist is 1:9″ so you can shoot a wide variety of ammo. Like Mossberg’s other MVP rifles, the Thunder Ranch rifle has a unique, patent-pending bolt design which lets it reliably feed from AR15 magazines. The Thunder Ranch rifle ships with a 10-round Mossberg magazine, but any milspec box-type AR-platform magazine should fit and function in the gun. Other MVP versions should be popular with our readers. We like the MVP Varmint model (shown above) which offers a gray/brown laminated stock suitable for shooting from the bench. The MVP Varmint is offered either without sights (product 27700), or with in a combo package (product 27710) which includes 4-16x50mm scope, and factory-supplied bipod. Both MVP Varmint versions have medium-contour barrels, with 1:9″ twist rates. Without scope, the MVP varminter weighs roughly 7.75 pounds. With scope and bipod the MVP Varmint is 9.25 pounds. MVP rifles will ship from the factory with sling swivel studs and either 5- or 10-round magazine. MVP rifles are fitted with Mossberg’s LBA “Lightning” Adjustable Trigger System, which adjusts from 2 to 7 lbs. pull weight. The LBA trigger, like the Savage Accutrigger, features a central blade that blocks sear movement unless fully depressed. One of the best features of the MVP rifles is the stock, which comes with factory-fitted pillars. Mossberg fitted the MVP Varmint (shown above) with a nice, laminated stock that should work well either on sandbags or when shot from bipod. To ride the bags better, the fore-end is wider than typical hunting stocks, with a flat bottom. Stippling on the fore-end and pistol grip provide for positive hand placement. We think this stock is a pretty good design for the rifle’s intended uses. The lighter-weight MVP Predator design has a conventional fore-end, with a shorter 18.5″ barrel. Share the post "New Thunder Ranch Version of Mossberg MVP Mag-Fed Rifle"
Last weekend, at a 100/200 benchrest match in Visalia, CA, Walt Berger, founder of Berger Bullets, won both the Light Varmint (LV) and Heavy Varmint (HV) Grand Aggregates, as well as the Two-Gun Overall title. That’s an impressive sweep. Walt, who is in his mid-eighties, beat a field of talented shooters who were 20-40 years younger. What’s that line: “Old age and treachery always triumphs over youth and skill”? Actually, Walt has plenty of skill and it wasn’t treachery that earned Walt his Visalia victories. He made the right wind calls, aimed true, and he had good equipment. Walt was shooting a Saguaro-actioned rifle fitted with the new Nightforce 15-55x52mm Competition Scope. The light weight of the Saguaro action (just 26.6 oz.) and a shorter-than-usual 20 1/4″ barrel allowed Walt to make weight in the 10.5-lb Light Varmint Class, even with the 27.87-ounce Nightforce Comp Scope. Walt did switch to a heavier barrel for the 13.5-lb Heavy Varmint class. But his LV results suggest that Walt could have won the HV Agg using the lighter barrel as well. Walt was using 6mm Berger Column FB bullets for both LV and HV. L to R: Jim Nicolas, Tom Price, Don Nielson, Walt Berger, Bill Summers, George Pizzillo, Duke Rovarino, George Lozano, Joe Stanovich. CLICK HERE for full Match Results. Given Walt Berger’s success with a 20.25″ barrel at Visalia, I wondered how much weight one could save with a shorter barrel and the svelte Saguaro action. I ran some models using Dan Lilja’s FREE Barrel Weight Calculation software which predicts stiffness and barrel weight. Using this software, I could model different barrel profiles and diameters, with the goal of saving weight without sacrificing stiffness. I came up with an optimized barrel contour with a shorter cylinder length and more taper (.800″ at muzzle). The Lilja program said this barrel (at 20.5″) would be just as stiff as a typical 21.5″ benchrest barrel, but would be roughly 13.5 ounces lighter. That’s right, by changing the barrel profile and trimming 1″ from the barrel OAL we can save over thirteen ounces without losing stiffness (at least the software says so). A Saguaro action is 3.9 ounces lighter than a Stolle Panda. Combine that with the 13.5-ounce weight saving from a shorter barrel (with optimized contour) and you get a total weight savings of 17.4 ounces — more than a pound! That opens up a whole new world for 10.5-lb LV rifles. That extra pound lets a shooter run a heavier scope, or he can put another pound of weight into the stock and/or tuner. I discussed the topic of shorter, reduced-weight benchrest barrels with two world record-holding benchrest shooters who were at the Visalia match. They both observed that, while shorter barrels shot well, shorter barrels produced more blast/noise, causing flinch problems. Accordingly, both of these shooters stopped using shorter barrels. I wonder if “double coverage” ear protection (with custom molded plugs and electronic muffs) would attenuate the blast enough to make the shorter barrels more “shootable”. Perhaps, then, we would see more shorter, lighter-contour barrels at matches. Share the post "Walt Berger (in his 80s) Tops the Field at Visalia"
A digital version of the NRA Tournament Operations Guide is now available FREE online. While supplies last, there are still some copies of the previous version available through the NRA Program Materials Center. However, the newer, free online version will replace it. The 56-page NRA Tournament Operations Guide is loaded with information that will help your club or organization run efficient events. Featured topics include tournament planning, range operations, statistics, awards, and much more. A great resource for all match directors, the new guide covers eight different shooting disciplines. The NRA Collegiate Shooting Program brochure is also available online. More Competitive Shooting Division literature will be online soon. Check the NRA Blog for updates. This story by Kerrin Brinkman courtesy the NRA Blog. Share the post "NRA Tournament Operations Guide Now Available Online"
Can you imagine a shooting match that draws a couple hundred thousand spectators? Amazing right? Well that’s how many people turned out to watch the 2013 Int’l Biathlon Union (IBU) World Biathlon Championships (WBC) recently held in Nové Město in the Czech Republic. At the 2013 WBC, event organizers constructed a stadium and filled it with 201,000 spectators to watch the best biathletes in the world. Among national teams at the WBC, Norway dominated, winning an incredible eight of the eleven competitions, including all three relays. Tora Berger and Emil Hegle Svendsen each won two individual events and contributed to the relay Golds. Tarjei Boe added Gold in the mass start. These eight Gold medals were a record for the IBU World Championships; no other nation has been so prolific or dominant. On the other hand, biathletes from 12 different countries won medals — and that was a new record for medal distribution. In 2011 at Khanty Mansiysk, Russia, 11 nations took home a medal. This year 12 nations won at least one medal. Tim Burke from the USA earned a Silver Medal in the 20K event. This was the first medal for the red, white, and blue since Josh Thompson won the 20K Silver in 1987. In the world of precision shooting, it’s unusual for one ammo-maker to completely dominate a major shooting event. But that’s exactly what happened at the 2013 World Biathlon Championships. An amazing 32 out of 33 total medals awarded in Nova Mesto went to biathletes shooting Lapua ammuntion, specifically Lapua .22 LR Polar Biathlon. That works out to 96.9% of ALL medals at this year’s IBU World Championships. Hats off to Lapua for producing the winningest biathlon ammunition ever made. Share the post "201,000 Spectators Watch World Biathlon Championships"
The 8th Annual Shilen Swap Meet kicks off a month from now. Rain or shine, the Swap Meet will be held from 8:00 am to 3:00 pm on Saturday, March 23rd, in the Shilen parking lot (Ennis, TX). The event is open to “all comers” — both buyers and sellers. There are NO fees or costs. Anyone can set up a table or just back their truck up and drop their tailgate. There will be gun stuff everywhere — buy and sell as much as you like. And there will be FREE FOOD — complementary chili, frito pie, water, tea, or coffee. Factory tours will be given. During the morning tours, the drill, ream and rifle machine will be operating. Schedule so far is that factory tours (with RUNNING machines) will be offered at 8:00 am, 8:30 am, 9:00 am, 9:30 am, 10:00 am, 10:30 am, 11:00 am and 11:30 am. Tours will continue in the afternoon, but no machines will run then. Share the post "8th Annual Shilen Swap Meet on Saturday, March 23, 2013"
A few weeks ago at SHOT Show, Nightforce Optics introduced a new Competition Scope. When Nightforce heard about the upcoming U.S. Team practice session in Phoenix, the optics-maker overnighted us two prototype Comp Scopes to wring out under match conditions. From the start, we were impressed by these new 15-55X Competition Scopes. Darrell mounted one on his personal competition rifle, and the other on a mocked-up action, so people could hold it up safely in a steady fashion behind the firing line. The new scopes acted like magnets, drawing people from all over the Berger SW Long Range Nationals to check them out. The new Competition Scope is a 15-55x52mm. The new scope’s ED (extra-low dispersion) glass yields outstanding resolution. Remarkably, the resolution in the Competition scopes is even slightly better than the Nightforce 12-42x56mm NXS, with its larger 56mm objective lens. The color is definitely ‘crisper’ as well. Not surprisingly, the image quality is what most people noted first (see through-the-lens photo at right). The glass is great, and Nightforce included other thoughtful features as well. First is the side parallax adjustment that competitors have been wanting for years (this is one of the draws for the NXS scope in competition). The higher zoom range (with 55X power on tap), and the 60 MOA of vertical travel is also a much-asked-for (and useful) feature. The Team’s response to the prototype scopes was overwhelmingly positive. Nightforce has generously agreed to provide 10 new Competition scopes for the USA F-Class Team competing in South Africa next month. The Bloemfontein Range will be an excellent test of the new 15-55X scope’s capabilities! The prototype scopes had to be returned to Nightforce, and as it wasn’t much of a detour, Team Captain Darrell Buell paid a visit to Nightforce’s Orofino, Idaho production facility. Nightforce rolled out the welcome mat, providing not only a highly detailed tour of the location, but also the opportunity to say a few words in front of a meeting of all of the day shift and evening shift staff. It was good fun for everyone, the staff seemed genuinely fascinated by what the Team was doing with their scopes all over the world, and Darrell was equally interested in the attention and quality that was invested by the staff there in each scope produced. During the tour Nightforce provided a convincing demonstration of the rugged durability of NF optics. Each assembly station had a steel pillar fixture near the bench; the pillars were covered in a thin layer of rubber padding. As a scope was completed, the technician would grasp it by the ocular end, and strike the objective end (quite sharply) on the rubber-coated pillar three times. The scope would then be placed back on a optical test stand, and the image checked for shifting. This ‘strike test’ was then repeated three additional times (with associated checks), so that the top, bottom, left side, and right side were all tested and checked. Share the post "F-Class Team Tests New Nightforce 15-55x52mm Comp Scope"
In a video filmed during an “online town hall”, Vice President Joseph Biden told a questioner that a modern, semi-automatic firearm is not needed for self-protection or home defense. Biden told the questioner to buy a double-barreled shotgun instead. The Vice President went on to say the government has to make some limits on the weapons people can buy. Otherwise, he said, the wrong people would have flamethrowers and rocket launchers and billionaires could buy “fully-loaded” fighter jets. Share the post "Vice President Joe Biden Tells Americans: “Buy a Shotgun.”"
Like crosswords? Like guns? Well, thanks to Shooting Sports USA (SSUSA), you can try a crossword puzzle that tests your knowledge of gun stuff and competitive shooting. In the February 2013 digital edition of Shooting Sports USA magazine, you’ll find a crossword puzzle created just for shooters. There are some easy items, such as the location of the annual NRA National Pistol Championships. Other entries are more difficult, and may require some research. To print the crossword puzzle before you start working, click this Page 12 link, and then select the print icon. Spoiler alert — all the answers appear on PAGE 14 of the same February issue of SSUSA. CLICK HERE for Crossword Puzzle Answers. Share the post "Shooters’ Crossword Puzzle in Shooting Sports USA eZine"
This week on Gun Girl Radio, Julie Golob interviewed the talented Maggie Reese for a fun “girl talk” episode Gun Girl-style. Maggie is a two-time 3-Gun Ladies National Champion as well as a Season Two contestant on the History Channel’s Top Shot TV show. The podcast interview explores Maggie’s journey from new shooter to national champion. Maggie talks about the challenges that she faced along the way, such as dealing with injuries. Julie and Maggie also chat about their experiences of shooting and competing with other women. Maggie shares some of her secrets to having fun and looking great on the range. In addition to talking all things competition shooting, Julie and Maggie share some reality TV insider Top Shot talk. CLICK HERE to listen to this episode. You can also subscribe to get future Gun Girl Radio podcasts. Gun Girl Radio is a proud part of the Firearms Radio Network. The show features information and insider perspectives on shooting sports, training, hunting and all things outdoors by two of the firearms industry’s most talented female shooters, Randi Rogers and Julie Golob. Click icon at right to learn more. Gun Girl Radio releases a new podcast each Wednesday at 12:00 pm CST. Share the post "3-Gun Shooter Maggie Reese Interviewed on Gun Girl Radio"
Kirsten Weiss of Cornwall, PA was the 2012 NRA Women’s National Champion at the NRA Smallbore 3-P Championships held at Camp Perry, OH. She won the 2012 3-P smallbore championship in only her second trip to Camp Perry. Her first came nine years ago. Back then she was still learning what it takes to be a top competitive shooter. Her skills still raw, she placed second in the Sharpshooter Category. Not good enough. She resolved to get better — and she did. Weiss would go on to earn a spot on the Nebraska Cornhuskers rifle team. Her tenacity and techniques would garner recognition from USA Shooting and a sponsorship from Lapua Ammunition after a top eight finish at the Olympic Trials. She also has a been involved in hunting since age twelve. In fact, it was in the field that the foundation of her shooting skills began. Share the post "Smallbore 3-P Champion Talks about Shooting Fundamentals"